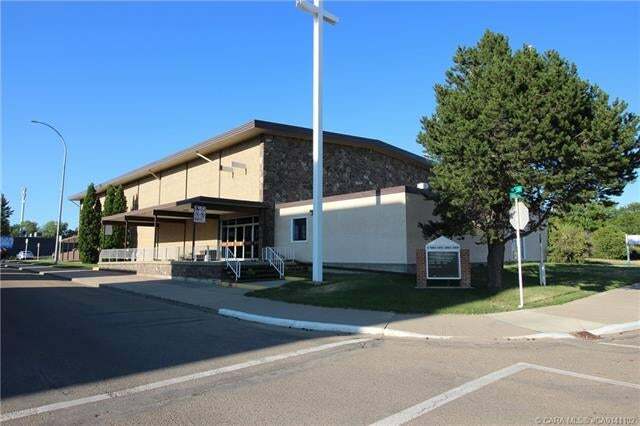 Church Property Located in the Heart of the City of Camrose! Exceptional City Centre Location with 7 lots Zoned C1. The property is 350’x120’ and provides ample parking and with over 12,000sq.ft on the main floor and 3,700sq.ft. on the upper level, it is a natural fit for another existing or growing church. The building was built in 1963/1982 and offers a large assembly/church area, large foyer/meeting area, balcony seating, multiple meeting rooms of various sizing, kitchen, kitchenette, offices, administration area and two attached garages. Roof was recently redone. Located in the Heart of the City Centre in the Camrose Community, there are lots of possibilities and opportunities for this property. An Exceptional Opportunity!